Headed down to Kaikoura early, crossed on the 8am ferry, not much to see bar good numbers of fairy prions and fluttering shearwaters. Two mollymawks, but as I was inside when they went past didn’t get onto them. Steve Wood from Motueka met me up at Picton and we headed down to Kaikoura, luckily the weather improved as we got closer. Quickly checked the seal colony and northern side of the Peninsula, where there were large numbers of Hutton’s shearwaters moving along the coast, and several giant petrels. We then headed out on an Oceanwings trip. As usual, an excellent trip, but nothing really out of the ordinary. 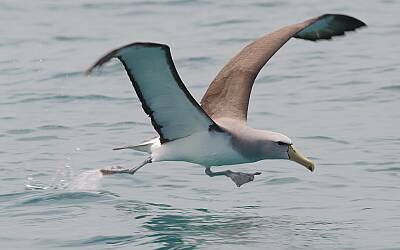 Perhaps the best birds were three Northern royal albatross at the back of the boat, and a little later an Antarctic cape petrel (capense subsp.) made an appearance. 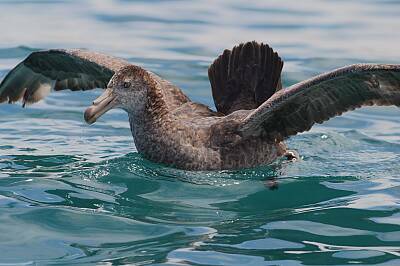 A flesh-footed shearwater with nylon fishing line wrapped around its wing also came in, and appeared to fly ok despite the entanglement. We didn’t stick around too much out in deep as there was a 2-3m swell and most on board were feeling green (I just held it together). We headed in close to the coast (seeing a small group of dusky dolphins at a distance, on the way), and checked out Barney’s rock where red-billed gulls breed close to the road. There were quite a few gulls nesting, and 10+ very large little shag chicks in various nests perched amongst the coprosmas on the stack. A surprise was a reef heron with a nest, and what appeared to be a large chick in it – I need to check the photos of this to make sure, but it looked like a chick with the boat moving around. We then headed back along the coast towards the harbour, in quite close scanning for the chinstrap penguin. No luck, but a couple of Hector’s dolphins made a brief appearance. Steve and I then headed back out to the Seal colony and headed up and over the peninsula walkway a bit and scanned the rock stacks and some of the coast, but no luck, although there were huge numbers ofHutton’s shearwaters still moving along the coast, and feeding with red-billed gulls just off the red-bill breeding colonies. Also saw a ‘Wandering’ albatross from the coast. We then decided we had probably done our dash, and so headed north with the aim of checking out Lake Grassmere on the way. We headed around to the seaward side of the lake (for directions email me) and found a good concentration of waders, grey teal and black-billed gulls (which looked like they were about to start breeding?). 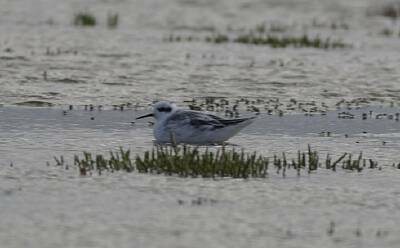 Amongst the waders we located the red-necked phalarope that had first been seen by Karl Evans and Scott Butcher on 9-10/11, awesome views of this great little bird from about 20m away. Got some ok photos (see below). Also got 12 red-necked stint and 7 pectoral sandpipers with good numbers of turnstone and a single golden plover. So an excellent end to the birding side of the trip……but a long trip home – 2am into Palmerston North.